Recently RancherMan was reworking some fences and one of those sharp barbs got him. He finished working on the fence before he came back to the house. So as soon as I saw this blood stain on his shirt I knew I’d better start treating it. Prompt action is vital to successfully removing a stain. Aaaanyway, even if you’ve got a rockin’ laundry detergent sometimes you need a little extra cleaning power, and today looks like it’s going to be one of those days. I had him remove his shirt and I took it into the bathroom and poured a little peroxide directly on those blood spots. Now I’m not a chemist or anything, but I’ve read there’s something about a protein in the blood reacting with the peroxide blah, blah, blah. I don’t need to know WHY it works, I just want it to work! So, after I let the peroxide soak on the stain for about 10 minutes I threw that shirt into the washer with some of my magical homemade laundry detergent. I know that heat will set a stain so I set the water temperature dial to cold. Then I turn the cycle dial to “soak”. I love that my washer has this option. But even if yours doesn’t you can let it fill and begin to agitate, then stop the washer for a few minutes to get the same result. 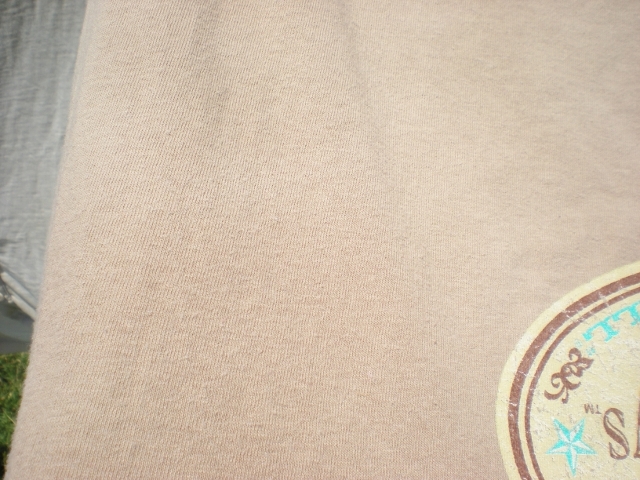 I don’t know if soaking is even necessary after the pretreatment I’ve already done on the shirt. But it’s an extra step I always use when I’ve got something stained and want to give it an extra chance to get GONE. After the washer goes through the soak cycle I wash as normal (again in COLD water) and use the high-spin option to get as much of the rinse water as possible out of the cloth. So I hang the clean laundry on our *retractable clothesline and wait for it to dry. If you don’t have a clothesline you’ll want to air dry your previously-stained item – perhaps a folding clothes rack or even hang the shirt on a plastic hanger with plenty of air to circulate around it. VOILA! No more blood stains. 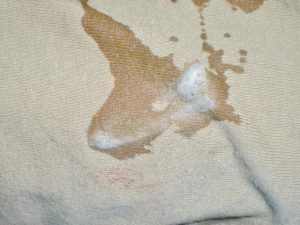 If there did happen to remain any hint of the stain I can simply pretreat again since I’ve not heated this stain in the dryer to permanently set it, although that’s seldom necessary. Now thankfully RancherMan’s way-too frequent skirmishes with our fences have never resulted in a full-on gusher. But for the blood stains we deal with here on the ranch this treatment method has never failed me. So there ya go. 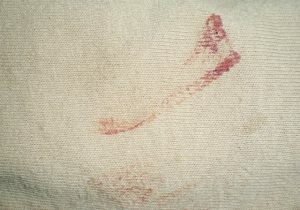 A little secret weapon I’ve discovered to battle one of our common laundry monsters – blood stains. It’s inexpensive, doesn’t require the purchase of a specialty product. And it’s been very effective for us. Give it a try and let me know how it works for you! * A word about our Affiliate Link – We are currently enrolled as an Amazon Affiliate. Occasionally I will insert an affiliate link into one of my posts if I think it may be of interest to you. I receive nothing from the manufacturer and I only link to products that I have used & love and feel you might love too. If you click on any of my affiliate links and buy something (almost anything, not just what was linked) I may get a small referral percentage from Amazon. But here’s the really important part – the price you pay for your items is UNCHANGED. This entry was posted in Blog Posts and tagged Environment, Frugality, Ranch Life, Summer on August 10, 2014 by Texas Homesteader. I am going to admit something slightly uncool about myself right now! 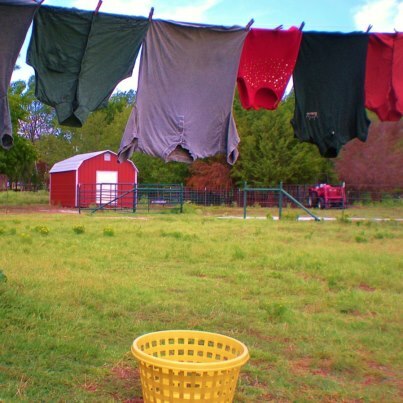 My family considers ourselves to be homesteaders, but I can’t stand line dried clothes and bed clothes! Everything is so stiff and itchy! I hope my homesteading friends will not think less of me! 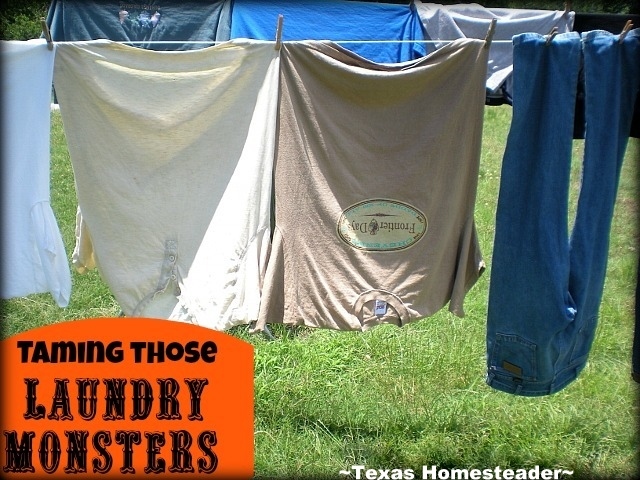 Lol, great post on removing stains, thanks for sharing on the homesteader hop! Great post! I love your blog. Vinegar poured directly on the stain is one of the most effective methods to clean blood. Blot until the stain is removed and rinse with water to remove the vinegar smell. I have read some method with baking soda, too. Greetings! I’ll have to give that a try sometime Tracey, I’ve never heard of that before. I know the peroxide has been screamingly successful for most of our random blood stains in our clothing. I have been using peroxide on blood stains for years!! Thanks for Linking up at My 2 Favorite Things on Thursday!! Hope to see you again this week!! Pinned! The best and cheapest stain remover I haave ever stumbled upon (I was desperate and had tried everything I had in the house!) is Lava bar soap. I wet the clothing, wet the bar of lava and rub it in and let it sit. I might have to repeat this several times but it works 99% of the time. No chemicals and very very frugal! For oil and grease I use Pine Sol poured on the stain right from the bottle. It really cuts the grease and oil. Works every time! These are trial and error techniques found through 64 years of home keeping! Thanks for sharing your laundry tips at the HomeAcre Hop this week! Will be sharing on our HomeAcre Hop Faves Pinterest Board. Thank you for sharing this tip and linking up at Wake Up Wednesday! I’ve pinned. Barb wire is nothing to mess around with when it comes to getting a cut or scrape. I remember when I was younger I had to go get a shot due to rusty barb wire. Not fun at all….I hate having shots I remember my mother always had hydrogen peroxide on hand of which she used for number of uses including being encountered by a skunk; human or your dog. Just mix a fresh 16 oz. bottle of hydrogen peroxide, 1/4 cup baking soda, and a tsp. of dish soap to clean your dog. The skunk odor disappears and your loveable pet is once again allowed in the house. :} One nice thing about HP is good for a great number of uses. Between vinegar and HP they are a couple of my best cleaning products. To ward off fungus from your plants; add a little hydrogen peroxide to your spray bottle the next time you’re spritzing plants. Use 1/2 cup of hydrogen peroxide added to one gallon of water for your plants. I have tomato juice on a white t-shirt I have laying on my washer right now…I am going to go try your method and see if I can get it out! Thanks! Peroxide is pretty amazing stuff, eh? i found out about the peroxide-blood thing a while back – it’s like a miracle! And has saved so many of our clothes. I’ve used peroxide as part of a carpet cleaning mixture. Works like a charm! I miss using my clothesline in the summer. Too humid outside here to do much good! Thank you for joining us on this week’s Maple Hill Hop! Peroxide… Who knew? That interesting bit of info. is sure to come in handy. Recently we had to wrangle with a large tree that fell across our road. In these types of situations, my husband can sometimes end up looking like a slasher got hold of him. “Honey? What happened?” Response, “Oh, I didn’t even notice that was there.” Another reason to keep the peroxide handy. 🙂 Great tip… Thanks.